SoilWorx Mystic is a shale mulch which is a very decorative mineral mulch that will last a long time providing your garden with fantastic aesthetics. Unlike your traditional rounded pebble, Mystic shale mulch is composed of flat stone pieces. Mystic shale mulch is also good for keeping the soil cool. By nature, it is very micromicaceous, meaning it contains thousands of tiny microscopic sized grains of clear muscovite mica. These particles act like thousands of tiny mirrors in the stone which reflects the heat. For double effect, the light colour of the stone also reflects the heat keeping the soil cool. The Mystic shale mulch contains 2-5% silty clay which washes off readily, bonding together the bottom layer of stone. This not only adds an additional air circulation barrier on top of the soil, but also acts similar to a wetting agent, allowing water to readily penetrate the soil whilst still permitting the soil to breathe naturally. Long lasting. Unlike your traditional organic mulches that start to decompose after 2 years, Mystic shale mulch is a stone which will last longer. Helps keep soil warm in winter and cool in summer. The nature of the stone helps is to reflect the heat which keeps your soil cooler in summer and protects it from the cold in winter. Lasting attractive colour. As it is a natural product, it's colour is not prone to fading as you would find with your dyed mulches. Low maintenance. Due to their flat appearance, Mystic shale mulch is less likely to be wind blown and roll and scatter which means you will be able to enjoy it for longer before a top up of mulch is required. Fire resistant. Being a stone, Mystic shale is not flammable. Mould resistant. 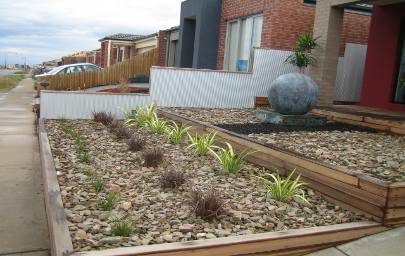 With traditional mulches, when it is consistently damp it can start to develop mould, with stone mulch as it does not retain any moisture it is one issue you won't be having. Little compaction with time. As Mystic shale does not decompose there is little compaction over time. Not easily wind blown. Being a heavier product that the organic mulch it is less prone to be wind blown, this also extends the life of your Mystic shale mulch as it doesn't require any top up. Pet and plant friendly. As a natural product you will be less likely to find any chemicals that you would normally find in recycled mulches. Lower long term cost than conventional mulches. Because Mystic shale is know to last for longer periods before the garden requires a top up, the long term costs involved in the maintenance is considerably less.